Most elementary and secondary students are using mobile devices in their studies, either in the classroom or at home. And, according to a new study, the majority would like to be able to use them more in class. The study, conducted by Harris Interactive for educational publisher Pearson, polled more than 2,300 American students in grades 4 through 12 (aged 8 to 18) about their use of digital technologies for educational purposes. It found that only 1 percent of respondents used no digital technologies whatsoever in their studies. Most indicated they use laptops (71 percent) and/or desktops (66 percent). But significant chunks of the student population are also using less traditional computing devices. Half, according to the survey, use smart phones in their education, either in class or at home (or elsewhere). Only 21 percent are using "full-size" tablets (such as the iPad or Google Nexus 10), while slightly more (23 percent) are using small tablets, such as the iPad mini or Google Nexus 7. Basic e-readers (16 percent) and netbooks (10 percent) were the least-used devices among the respondents to the survey. That usage varies fairly widely by grade level. In elementary grades, slightly more respondents indicated they use desktops than those who use laptops (68 percent versus 64 percent). But almost a third of the total (32 percent) said they use small tablets versus 21 percent using larger tablets. Thirty-five percent use smart phones for educational purposes. Sixteen percent use basic e-book readers. Netbooks, at 5 percent, are nearly non-existent in elementary grades. 12 percent still use netbooks. In high school, penetration of laptops and smart phones jumps considerably, with smart phones edging to within five percentage points of desktops. 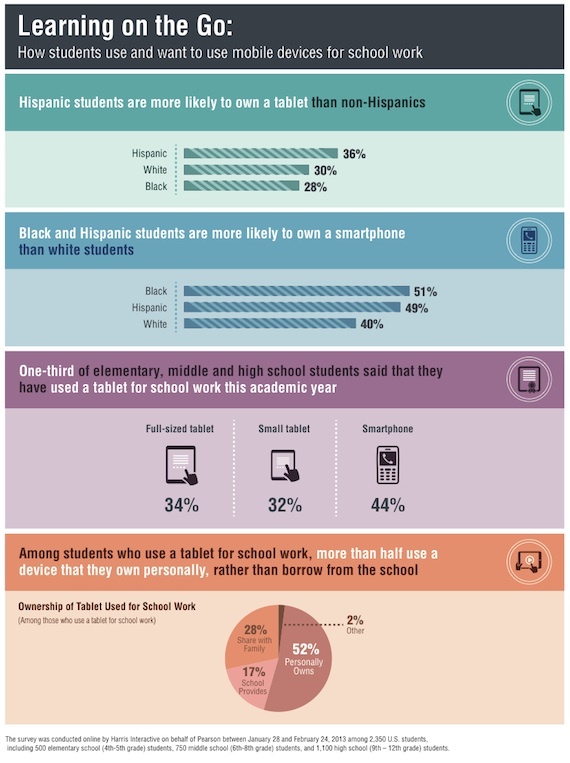 Source: Pearson Student Mobile Device Survey 2013, published April 2013. Click for larger images. Ownership of these devices is another story. Half of all students own a laptop, while only 37 percent own a desktop. A fairly large 43 percent own their smart phones. (This implies that some of the students who use smart phones for education do not own those devices themselves.) After smart phones, the ownership numbers drop off dramatically: 18 percent own small tablets; 14 percent own full-size tablets; 12 percent own basic e-book readers; and 7 percent own netbooks. A fairly significant 13 percent of students indicated they do not own any of these devices. Almost a third of elementary students own a laptop (32 percent), and 19 percent own a smart phone. Digital devices on the whole are used fairly frequently at all grade levels. A full 60 percent of students who use their laptops for school work use them at least two to three times per week, and 27 percent of smart phone users use their devices for educational purposes (explicitly not texting or social networking) two to three times per week. Those figures drop off to 20 percent for full-size tablet users and 19 percent for small tablet users. High schoolers are the most frequent users of laptops and smart phones, with 67 percent and 37 percent, respectively, indicating they use those devices at least a few times a week. Elementary students take that prize in small tablet use, at 21 percent; middle schoolers are the most frequent users of full-size tablets, with 23 percent saying they use them at least a few times a week. Out of all the students surveyed, 67 percent indicated they would like to use their mobile devices more often in class; 21 percent said they're using their mobile devices the right amount of time as it is; and just 10 percent said they'd like to use the devices less often in class. At the elementary level, 49 percent of students said they use their tablets for school work at least a few times a week, followed by 44 percent in math. So just how are students using their full-size tablets? Overall, the most popular use was research, at 72 percent, followed by homework, at 62 percent. Forty-five percent indicated they use their devices to check assignments, a figure that shoots up 10 percentage points at the high school level. Joining discussion about school work (15 percent). 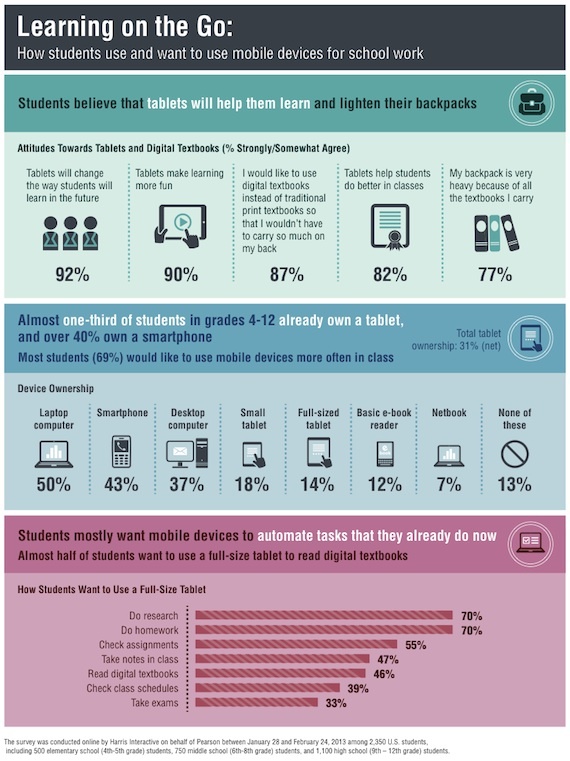 The vast majority of students (92 percent) said they think (agree strongly/agree somewhat) that tablets will change the way students learn in the future. A surprising 90 percent said they think tablets make learning more fun, and 82 percent said they help students do better in class. And 87 percent said they would prefer to use digital textbooks "so that I wouldn't have to carry so much on my back." The complete report, with methodology and additional tables, as well as state-by-state breakdowns, is freely available on Pearson's site.